home for many a Covenanter. As long ago as 1425 in the reign of James I there were acts made that required imprisonment with references to both the King`s prison and the Sheriff`s prison. Moreover these were establishments distinct from the dungeons of individual castles and the like and might be construed as the beginning of a prison service. An Act of 1487,c 10 (King James III) is the earliest authentic record entitled “Of the keiping of arreisted trespassoures” and established that the Crown took responsibility for prisoners prior to trial. Very briefly the original charter for the building seems to go back to Robert II in 1386, but as the name implies, a place for collecting tolls and customs for the burgh. Its use varied considerably over time and was the subject of many renovations and extensions as well as a major overhaul and rebuilding in 1512. 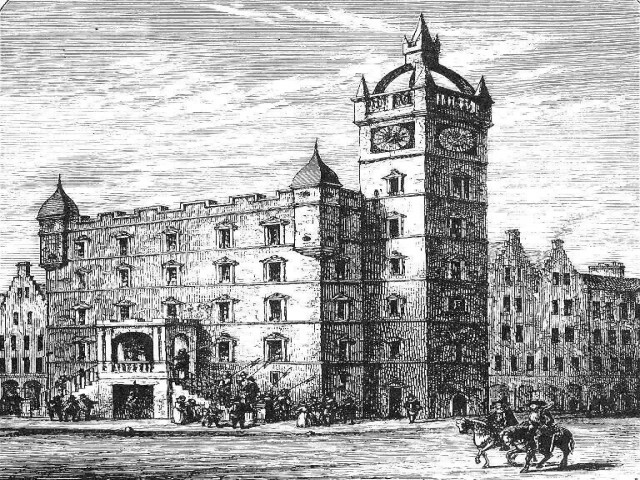 The earliest evidence of its use as a prison dates to the letting of the booths around the building in 1480-81 …”the sext buith is maid a presoun”. It is a reflection perhaps, of the style of punishments inflicted that there was only one booth allotted. Punishment was usually corporal and executed quickly, often the same day or within hours of sentence, so there was no need for a long stay prison. The practice of `warding` appeared about 1494. This was a form of confinement rather akin to open prison in that a person could be warded in the castle, the tolbooth, his own house, another house; it might be close (under supervision) or conditional upon not straying more than a specified distance from the town. Generally they had to be responsible for their own expenses. The practice was especially used against the Covenanter ministers in the early 17th century, when they were warded `beyond the Tay` or to Aberdeen , even the Shetland Isles, – just about as far away from their homes that they could be sent and to areas without a strong Presbyterian populace. Freedom, or rather liberty, usually depended on obtaining a responsible person to stand caution or guarantor, for any subsequent appearance before the court. It was the use of warding that marked the transition of the tolbooths from small short stay establishments to longer term holding prisons. With it inevitably grew bureaucracy and scope for bribery and malversation by all grades of officers in the law enforcement system. 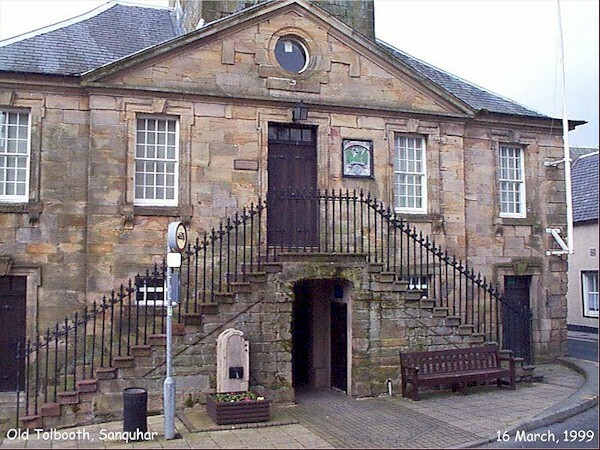 This was greatly exacerbated when a law was passed that allowed the tolbooth keeper to supply food and wines to prisoners, the `sutlery` as it was called and made many a prison keeper a rich man. 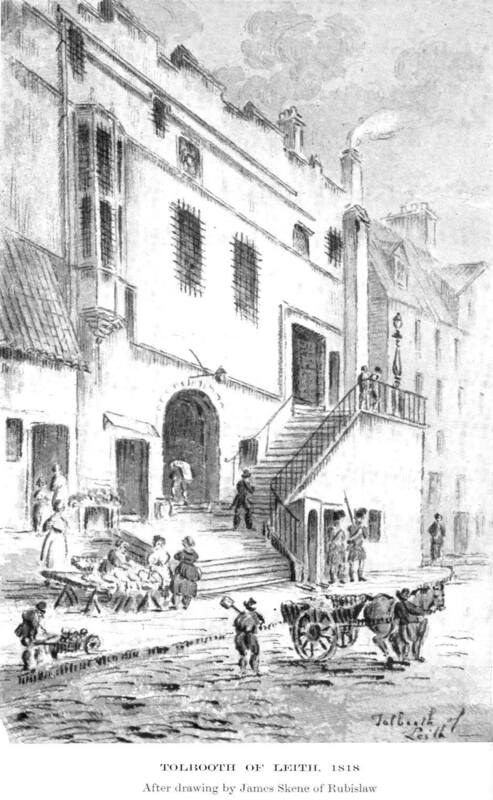 The poor and destitute had only a small amount of bread and water or literally starved which of itself led to disturbances and riots in Edinburgh tolbooth in 1610; and in the Canongate tolbooth in May 1692. Hanging, drawing and quartering was a special punishment for the most serious crimes which in Scotland until the mid 17th century, meant the limbs cut off at the joints. But quartering of the torso (the English practice) was invoked against the Covenanters, particularly David Hackstone. A fairly late development was the creation of the Iron House, a room where prisoners were kept close chained to heavy metal bars that prevented movement and rest. The practice of displaying the heads of executed persons on the Tolbooth gables and the Town Gates seems shrouded in antiquity, but a record exists of the heads of Lord Hume and his brother William being displayed following their execution on 16 October 1516. In later years many heads, including the Marquis of Montrose (executed 21 May 1650) and the Marquis of Argyll ( executed 27 May 1661) were two among the many Covenanters and ministers whose heads and body parts were displayed in terroram. It seems to have been in 1551 that the punishment of hanging a body in chains till it rot, first came in, when a John Davidson was executed for piracy by hanging in irons within the flood mark near Leith. west end. Being so close – adjacent, to the Parliament House the Edinburgh tolbooth served as a transit station for prisoners to be brought before the Justiciary , the Privy Council, High Commission etc. Leith tolbooth dates from about 1565 and the Canongate tolbooth from 1591, Leith tolbooth was demolished ca 1829 despite attempts by Sir Walter Scott and others to preserve the building. For over a hundred years previous the Leith tolbooth had been a charge on the citizens of Edinburgh and this could have been a factor in the decision to close it when more modern establishments were built. 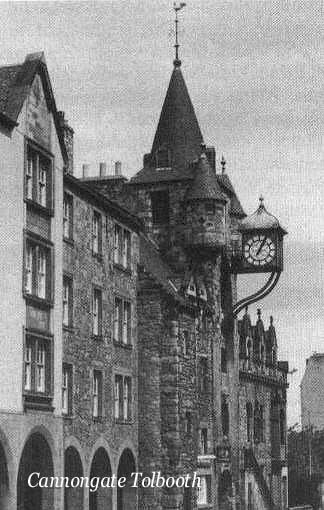 The Canongate tolbooth was discontinued as a prison on 10 July 1840 but reopened temporarily in 1842 until 1 January 1848. 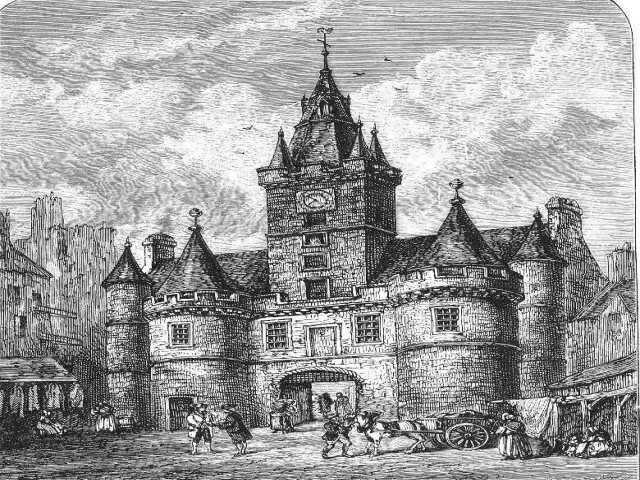 The Canongate was notable for the fact that it was locked up at night and the keys handed in to the Governor`s house about 500 yards away while the custodians went home to their own beds. The prisoners were left to their own devices -the scope for escape was thus greater here than other tolbooths who had staff in residence. The village of Broughton (Bruchtoune) near Edinburgh was a barony then a Burgh of Regality which gave it special powers including trial of offenders. 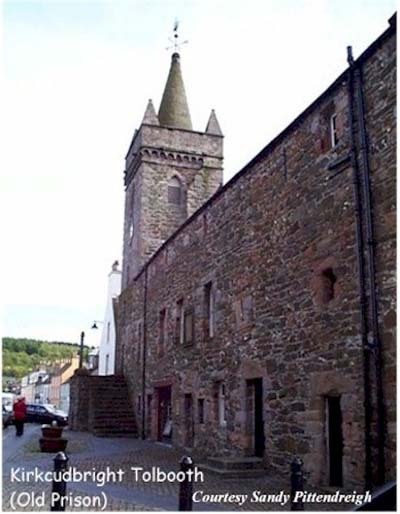 It had its own tolbooth dating from ca 1582 until ca 1829. The district had a reputation for witchcraft and many accused received justice by the Baron Baillie at these premises. As late as 1717 a Robert Irvine, chaplain to Baillie Gordon, was convicted of witchcraft, had his hands struck off and hanged. His hands were fixed on the tolbooth and body thrown into a quarry-hole. This punishment was quite unusual , possibly because he was a man and servant of an influential person, The usual punishment for witches (mainly women) was to be tied to a post, strangled and then the body burnt. Only in exceptional cases was a person burnt alive. of Edinburgh; built in 1513 it was demolished in 1764.